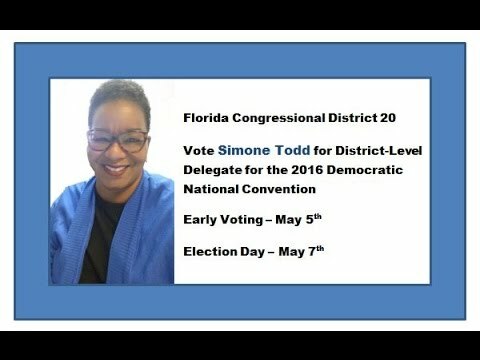 This year I am running to be a Florida District 20 Delegate because I want to make sure the voices of the great people making up this diverse district are represented at the 2016 Democratic National Convention in Philadelphia! Early voting takes places on May 5th from 3pm-7pm and Election Day is May 7th from 10am-2pm. Make sure to bring your voter registration card and ID as volunteers will be checking to make sure you are in the correct congressional district. Thank you for your support and looking forward to meeting you on May 7th!